Exuding classic elegance, this smart black leather strap watch by Seiko is powered by solar energy, and is crafted with a sleek stainless steel case and deep blue dial, and day and date window at the 3 o'clock position. 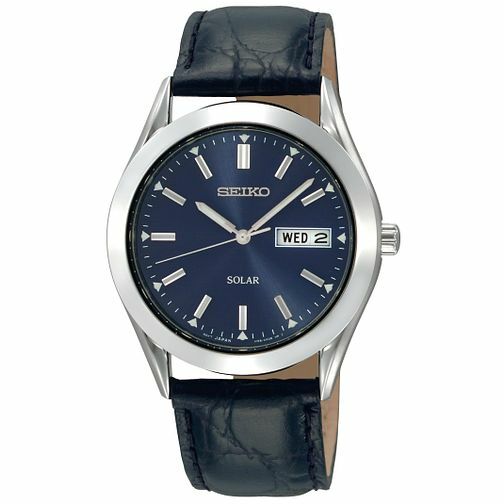 Seiko Solar Men's Blue Dial Black Leather Strap Watch is rated 5.0 out of 5 by 3. Rated 5 out of 5 by Anonymous from Excellent watch for simple men Bought this watch for my father's Christmas gift and he absolutely loves it. He is a very simple man when it comes to watches and doesn't like anything too big or too shiny. This watch had everything he would need in a watch; a great quality leather strap, a day and date, 3 hands, and a darker coloured face. I wanted alternative power in the watch so that he doesn't have to get the battery replaced. He has been showing it to everyone, which is typically a great sign that he liked it. For the price tag, this is well worth it. Not to mention Seiko being an excellent brand you really cannot go wrong.